My husband and I love to hike, and we're in the process of getting Marleau trained to come with us. While we're carb-loading in preparation for a big hike, Marleau's stuffing his face with the finest dog food we've found. 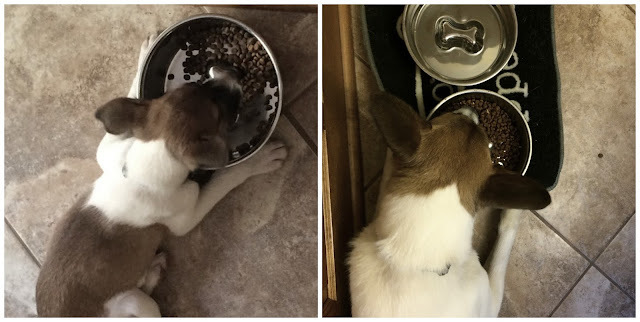 He still plops down to eat his meals! -Towel to clean your dog...because he WILL get sweaty and dirty, just like you! It's important to train your dog first with small hikes--don't take him on a strenuous trail the first time out! That would be as hard on a dog as it would be on a human. Even though it may slow you down, you should stop frequently and offer your dog water throughout your hike. Don’t feed your dog a large meal before a hike instead, feed a portion of his meal and supplement treats throughout the hike. For your sake as well as your dog's, avoid hiking during the hottest part of the day and keep walks to a reasonable pace and distance. Watch for signs of overexertion like excessive panting, drooling, weakness, or bright red gums. If you can, hike where there is shade and some water along the way for cooling paw pads. After the hike, check for fleas and ticks, even if you regularly treat your dog for those pests. Purina® Pro Plan® is dedicated to helping owners discover their dog’s full potential through high-quality, great-tasting nutrition and expert resources. They have a team of over 400 scientists including pet nutritionists, veterinarians, and behaviorists, and every ingredient is carefully chosen for a specific purpose. This food has a taste dogs absolutely love, satisfying every dog from those picky eaters (not our pooch!) to dogs who barely pause to take a breath while eating. Real poultry, meat, or fish are used as the primary ingredient in all dry formulas, which feature a combination of crunchy kibble and tender shredded pieces for a taste and texture dogs crave. 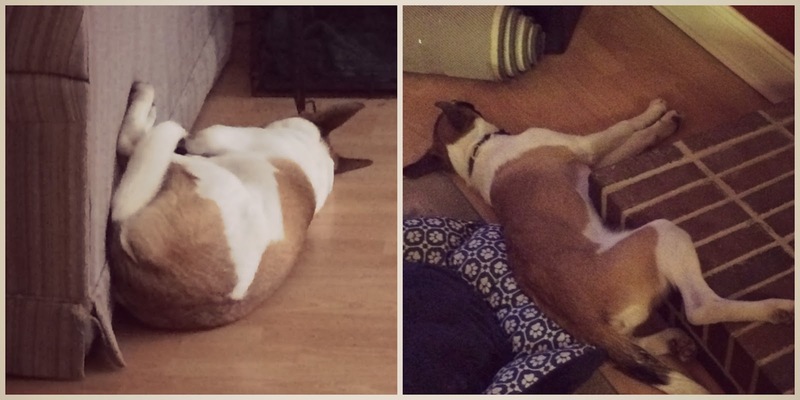 We got our new and nutritious dog food at PetSmart, and Marleau had a blast--he made himself right at home! (Coupon alert: SPEND $15 on any Purina® Pro Plan® product, 5/31–7/5 and SAVE $15 on your next purchase of 10.5-lbs. 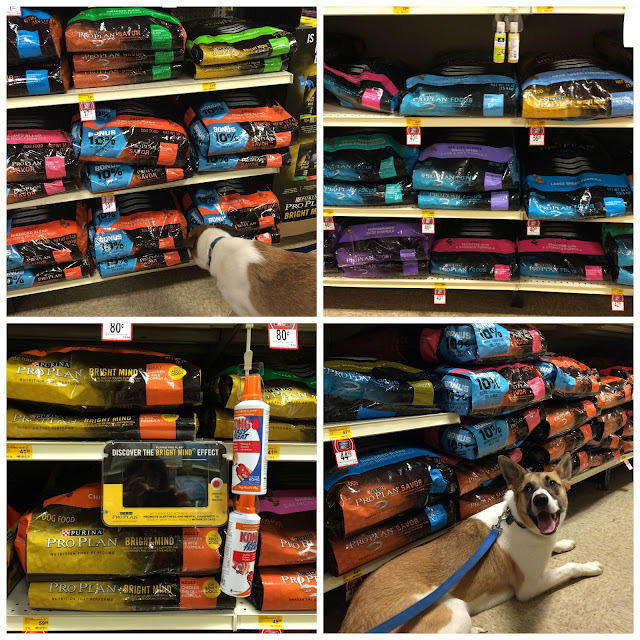 or larger Purina® Pro Plan® Dry Cat or Dog Food or Litter by 7/31.) You can and should find out more about Purina® Pro Plan® on their Facebook page, or follow them on Twitter and Instagram, where you'll see just about all of the cute critters you can handle! Whatever you do, spend as much time with your pet as you can--savor every moment! haha...he surely enjoys his food! He is so adorable, Grace. What a lovely little face! You could never be angry at that. Jeff always puts a harness on Tank when they go hiking for better control. He says a retractable leash is a great idea, too, because then Tank can wander around a little when they're in uncrowded areas. (Tank is the black German Shepherd who hangs around here.) Your Marleau is adorable! He's such a cutie! I love little dogs. They've got so much personality. We really want one but our apartment won't let us have one. I LOVE those ears! He's adorable! Wow, what a cutie! Doggie carb-loading... too funny!